Will Not Tolerate Invasion of California Even if It Is Peaceful. 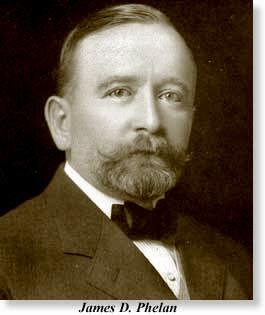 James D. Phelan, mayor of San Francisco from 1896 to 1902, chairman of the fire relief committee, is in Boston, and has spoken on affairs in his home city. He does not condemn San Francisco's union labor; he takes the orthodox San Francisco attitude of opposition toward the Japanese on the coast, rejoices at its delivery from the grafter and is full of hope for his city. "The conviction of Mayor Schmitz and the rout of [Abraham "Abe"] Ruef, the political "boss," who made a confession which has criminally involved his followers and "patrons," have at last brought the government of graft, which existed for several years in San Francisco, to an end. "I am not surprised that the East should have had a poor opinion of San Francisco so long as it supinely endured shameless pillage and unrestrained corruption. "The vigilance committee period in the history of California has long since passed, and the methods recently pursued were legal methods, and the results have maintained the dignity of the law and proved its efficacy. This result was not gained, however, without labor. Hard Work to Clean City. "Rudolph Spreckels, president of the First National Bank, representing the citizens, brought to his assistance Atty. Francis J. Heney, who had successfully prosecuted the land frauds in Oregon, and William J. Burns of the secret service. Dist. Atty. Langdon of San Francisco considered himself bound only by his conscience, and after nine months' work indictments and trials are following in quick succession, and it may be said now that, so far as municipal government is concerned, San Francisco is purged of its evils and, in the hands of the prosecution, is guaranteed clean and stable rule. "The grafting officials are not, however, the only culprits. The officers of the telephone, street railway, gas and electric companies must answer to charges of bribery. These corporations were not "held up"; they sought privileges, and they are suffering now from the consequences of ordinary corporate greed. "The street railway company, for instance, wanted a privilege to convert a cable system into an overhead trolley against the protests of the citizens, who urged them to use the underground conduit system, and to pick up the trolley in the suburbs. They preferred to pay $200,000 in bribe money for the privileges. "The telephone company paid a large bribe to keep out a rival, and the rival paid a large bribe to get in. "The gas company paid a bribe to the supervisors to prevent them from carrying out their pledges to reduce the gas rate to 75 cents, and it was fixed at 85 cents. "Much has been said in the East of the labor situation. Immediately after the fire, the labor unions passed a resolution not to raise their scale, but so eager were owners to build during the emergency period for a year after the fire that one employer would take mechanics from another by paying an extra dollar a day, and consequently labor became demoralized and one craft after another made demands for increased compensation. "They argued that rents had advanced for flats and cottages 50 per cent, and that they should receive more to meet the additional cost of living. There was a great deal of truth in this, but with the increase in the number of new buildings the rents began to fall. I notice within the last few days that 10,000 iron workers and machinists have gone back to work at their old wages and that the street cars are being run by non-union men without interruption during the day, over all lines. "Before the great fire the wages were not excessive; for instance, carpenters then received $4 a day, and during the subsequent emergency period received $5. Now, wages are going back to the lower level. "The city has temporarily housed its business, and is settling down to the slower process of permanent construction. The money market is tight, which will have, unfortunately, a depressing effect, and it will be now with the laboring men not so much the question of wages as of steady employment. "The Japanese question with us is not today a race question, but a labor question. The Japanese have established restaurants in the districts where working men live, and as they are not union establishments, union men are warned away. The same would be true of a non-union restaurant conducted by whites. The Chinese question has been solved by the restrictions of the immigration of coolies and the Chinese now are never molested. "In spite of disaster, the custom house receipts an the bank clearings show for the last year considerable gains. We have $9,000,000 of customs receipts and $2,074,000,000 of clearings. Clearings at Los Angeles for the same period amounted to only $634,000,000. "San Francisco is recovering from its great disaster with most surprising and satisfactory speed, and I am sure this will be grateful news to the people of the East who showed their affection and interest after our great disaster by sending us generous contributions, which bridged over the critical period in our history and set us on our feet. "Boston led in this movement, and San Francisco desires to make its grateful acknowledgment. "In five years San Francisco will be a better city than ever before. New building laws and a new auxiliary fire protection system, drawing its water from the bay, will give us security."